The 2010 Annual General Meeting of Ilkley Harriers Athletic Club was held on Tuesday 28th September at Ilkley Lawn Tennis and Squash Club after the Tuesday night run. A good meeting, with a new Committee elected for another action-packed year! More on the Committee Page. Heavisides Henry writes ... I ran the Northern Vets Track Championships at Hyndburn in Lancashire today. First off I did the 1500m, a distance that I've never raced before. The speed at the start was quite brisk & I was some way behind the leading runners at the end of the first lap. However, I managed to gradually reel them in and overtook about 4 runners on the last lap to finish 4th overall (all age groups ran together) & take silver medal in the M55s in 5:04. Next came the 5000m. Being still short of full fitness & a bit tired after the 1500, my plan was to just try to keep up with the leader in my age group & not worry too much about the faster younger runners. This plan worked well & I managed to outsprint the 2nd placed M55 in the last 100m to win the gold medal in a relatively slow 18:46, again finishing in 4th place overall (out of about 25 runners of all ages). I was pleased to win two medals in only my 2nd & 3rd ever track races. Next up is the Northern Vets 10000m in 3 weeks, if anyone else fancies having a go on the track, let me know. Sarah Fuller reports... Someone must have ordered the now customary sunny clear weather for the 4th and my 3rd RAB mountain marathon. The event is run on a score format with standard classes doing 6 hours on saturday and 5 on sunday, the elite class get an extra hour each day. Starting from Bampton in the north east lakes the event area centered on haweswater and the high street ridge and environs. Running with a friend from pudsey and bramley, we started with grand plans which soon had to be curtailed to more realistic objectives! A meandering route took us past a few checkpoints and some large tussocks, over high raise and steeply down to hayswater, a debate whether to take in the points on hartsop dodd thankfully resulted in what was to be a good decision (ie. Not on your nelly!) as we took a route below angle tarn, around ullswater and back over bedafell to overnight camp at the very scenic martindale. We thought our score of 205 pts modest so were suprised when we found we were 50 points clear of the second ladies team. A lot of teams were timed out, caught out by the punishing terrain and some tempting far out checkpoints! A cold uncomfortable sleepless night later we were off for 5 hours of the same. Due to our 50 point cushion we played it safe returning to base with 145 more points to the tally. We were first ladies and 35th overall out of 260 ish. chuffed to bits to win, which was the icing on the cake of a classic weekend in the lakeland fells. Saw nicky j and Stuart? running in the elite they secured a fantastic first mixed team. No results yet so not sure if any other harriers out on this race filled weekend! Nick Pearce reports ... 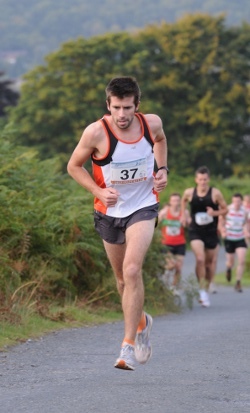 I think I was the sole Harrier at this final 2010/11 British Championship race. Won by Tim Davies, who also took the British titlle. A fantastic race, with four big climbs, 5,200 feet in total over 17 miles, and some great ridge running with marvellous views. Results awaited, but winning time around 2hr 20mins. I took just over 3 hours, with an unfortunate navigational error coming off the third summit adding 5 minutes and a few places - but no matter as I haven't done enough British Championship races to place this year. 2nd claimer Graham led for lengthy sections, but again unfamiliarity with the route took its toll and he finished fifth of around 300 finishers, but still beat the current English champion amongst others. Paddy Hagan reports ... For anyone who likes the fells and being on a bike off-road this is a must do event, and there were a few other Harriers in it. At 4 hrs 51 mine was not a PB, with plenty of excuses (puncture, random somersaults, etc) but basically Cold Cotes to Whernside did me in. As a consolation I rattled down Pen y Ghent to claw back a couple of minutes at the end. A cracking day overall, if rather windy at times, excellently marshalled, and with a race certificate with your time and class (just about second in my case) the moment you finish. Matt Cox adds ... What an amazing event and day with great weather - the wind blowing us up most of the climbs. This was the first time I'd entered the race, but will definitely be doing so again next year. After a steady start on the road, the action hotted up as we began the climb of Ingleborough, and Simon Fell. At this point the calves were burning and I was worried as to how I'd fair later on. An energy bar and good drink on the road from Cold Coates to Whernside seemed to perk me up and the climb of Whernside was as good as could be expected, with great views on a clear and sunny day. My first mechanical issue of the day unfolded here though, as I had problems clipping my shoes back in to the pedals and had to stop for a couple of min's to sort them out. By the bottom of Pen y Ghent I felt terrible and struggled up the first "rideable" section of track. By the time I dismounted to push/carry the last section, I had come round a bit and had a good climb up. However disaster struck on the descent (an one of the smoothest parts of the track!) when I punctured and lost around 6-7 mins and around 15 places. Well done to all other Harriers in what is definitely a tough event. 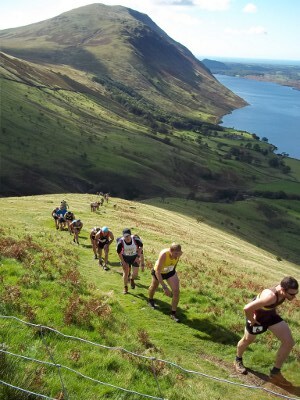 Alison Weston reports.... One of those too good to be true days in the Lakes this weekend for Scafell Pike fell race, the last of the 3 Peaks races. It is a 4.5 mile route from Wasdale Head straight up and down Scafell Pike. There is a flattish 1/2 mile for starters but then a very steep grassy ascent up Lingmell going up and up..... to meet the main walkers path from Lingmell col and on to the summit of Scafell Pike. A good descent of mixed rock and grass getting steeper further down, just when your legs start to feel like jelly! The winner was under the hour but I was content with 1hr 23 (5th Lady). The organiser puts together the results from Snowdon, Ben Nevis and Scafell Pike to find the 'King and Queen of the 3 mountains' and also 'Jack and Jill', the first couple! The 'King of the mountains' received a trophy of 3 peaks made with slate and could barely lift it off the table!! I was pleased with 3rd place in the Queen category - does that make me a Princess?? Clare Smith writes ... From the start in the field near Church Bridge in Dent just over 100 runners set off up the road for about a mile to join the Craven Way and on to Boot of the Wold where the route turns off to head for the summit passing Whernside Tarns. From the top of Whernside, we were directed through a narrow gap in the wall and down to the head of Kingsdale to rejoin Deepdale Lane for a short distance before going on to Green Lane, known locally as Occupation Road. There is a 1.5 hour cut off at this checkpoint, after which the track is fairly level to Blea Gills before the climb up to Great Coum. I had been advised to save some reserves for the second peak but I still found it a difficult climb traversing rough ground to the summit after the enjoyable run down from the top of Whernside. Still, it was all down hill from here back down to Dent after clocking up over 12 miles and 2871' of climb. A well organised race with plenty of marshals (from cave rescue) giving friendly encouragement. Jim Ryder adds ... I also enjoyed the run up Whernside on Saturday. A great mix of terrain over Yorkshire's highest mountain. Recommended for next year. Amanda Parnaby reports ... A choice of 10, 20 or 25 miles around Bland Hill, Blubberhouses and the reservoirs at Fewston, Swinsty and Thruscross. I had intended to do the 25 miles but when I discovered my companions on the first section were taking either the 10 or 20 mile options, I decided to opt for the 20 miles. Completed in 5 hours. I saw Helene Whitaker and was told she had won the 10 mile challenge in 1 hour 37 mins. Any Wiggans reports ... Top Tip, runfans - training almost certainly helps you run faster. A satisfactory day out at the GNR but much, much harder than running at that pace should be. The start was pretty horrid - as I (think) I put an expected finish of about 1:25 down I was in what I thought was a decent pen - but actually it was HYOOOOGE and the first mile was slow and involved lots of weaving round people running really very slowly. Got into my running after about a mile and a half but then my Garmin went a bit wonky in the underpasses and was reading about 0.2m short, but after what it told me was a 5:47 second mile (it wasn't - nearer 7:30) it was showing 6:30 per mile til the road went upwards when I slowed to just under 7's. The adjusted target for my injury (and pie) wracked body was sub-90 so I reckoned with a few 6:30's I could afford to slow a bit on the uphills, and sure enough I hit 5k in 21m, 10k in 42 and 15k in 63m - so "even paced" was the name of the game and as sub-90 requires 21:20 per 5k so I had maybe a minute in the bank. But at about 10 miles I started to really feel the lack of training and/or the surfeit of food - and whilst I didn't slow too much it just got really, really hard. The top of the last climb is just after 11m and that section was really hard, with a 7:08 mile, and even the amazing support on the sea front didn't produce a significant accelaration although I did dip down below 7's again. The finish seemed to be getting no nearer, and as my Garmin said 13.1m before it was properly in sight I got momentarily grumpy and wished I was somewhere else. In the end it was 1:29:08 for 489th place - so definitely in the "satisfactory" camp but far too much like hard work. In the "race a celebrity" stakes I took a scalp I've been after for a while, passing Tony Audenshaw (or "Bob off Emmerdale" as he's known in our house) on the Tyne Bridge, but I'm sure Nell McAndrew will be pleased to have taken revenge for the kicking I gave her in the Dewsbury 10k in 2007. I saw Andrew Wilson in a cage near the start and I see from the results there were a good number of Harriers running, but I'm afraid I didn't see anyone else. Paul Stephens reports ... A good turn out of Harriers for this trail race organised by Abbey Runners. 7.3 miles from the bottom of the Keighley Road - a couple of climbs, steady across the top and a fast descent - too fast for me as I was overtaken by both Mike Baldwin, Duncan Cooper and Richard Reeve?? (shurely some mistake....) The route went up the Keighley Road, West and along the upper edge towards Addingham High Moor, back up to the Buck Stones before descending to hit the road on the Keighley side a mile or so below Whetstone Gate. A climb up the road, over the top and down to the track to Silver Well Cottage before a fast run in along the path above Panorama Drive and back to the start. A bottle of beer for all finishers. I'll save mine......for tomorrow. Superb running weather, and an enjoyable outing. Prizes for Harriers included 2nd lady for Rebecca Mon-Williams. Chris Matthews ran her first fell race!, and Liz Price was 1st lady vet. Times tbc. 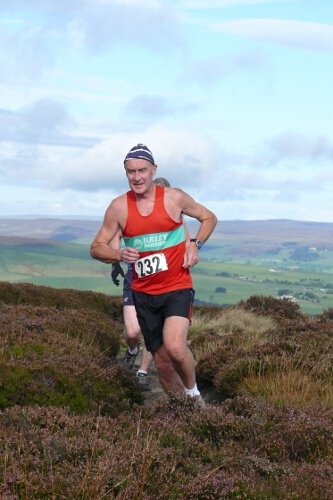 Tracey Greenway reports ... on a near perfect running day it was great to see a few familar and fresh faces in their red and green vests out on this classic baby long fell race. There are no offical results as yet however Dave Wilby ran a blinder with a top 10 place overall. I finished 2nd lady to Laura Jeska and first lady Vet. Heather Dawe and Nick Pearce both commented that they were pleased with their runs. The route starts with a downhill sprint on tarmac to cross the river (no footbridge this year) and continues with fast running on farm track until at 3km you pass through the intake wall and suddenly hack up the hillside with a 550 metre climb to Wetherlam. This is the biggest single ascent of the race. After Wetherlam you pick up a rocky path to the base of Prison Band which leads directly to the summit of Swirl How 802m, the highest point on the route. The next section is confusing in mist as you contour round the western flank of Great Carr on a pathless hillside to meet the descent to the Three Shires Stone road crossing. After the road crossing a good path leads up Pike o' Blisco, however apparently there are various options for straightening out the line. This year i managed an optimum one. There is a short out and back at the summit of Pike o' Blisco before starting the super confusing descent towards Blea Tarn. The problem here is that you can't see Blea Tarn or tell what you are aiming for. After crossing the road at Blea Tarn you must brace yourself for the sting in the tail, with a steep slog up Lingmoor Once again, after the summit of Lingmoor the route is not entirely obvious and there are a couple of route choices to reach the grassy descent and rocky zig-zags that drop you onto farm track with 1 kilometre of fast slightly downhill running to the finish. I've run the race a few times over now and can honestly say it never disappoints. Tracey Greenway reports ... on the quest of becoming a better all round runner I lined up to run in my first flat 5k road race. Bearing in mind the weather was less than perfect with sideways rain and gail force winds I stood on the start line feeling confident. There was no way I was getting lost on this course! It consisted of running straight down the bypass to the turning bollard and back again - simples!!! So why oh why did I do what I did next!! I ran the race in a controlled but hard pace enjoying the moment, until 200 meters from what I thought was the finishing funnel. Unfortunately for me, the marshall, the time keeper and lovely clipboard lady I decided to run left of the funnel taking them all by surprise and and ending up in one very muddled mess, lets say I make a better skittles ball than I do a fast finisher! It was a very good night not to know me!! The race organisers did give me a finishing time of 20.13. I finished 3rd lady 1st FV. The race winner was Ben Conner From Derby AC in 15.34 and 1st lady was Abby Norman also Derby AC in a time of 17.51 I am hoping to go back on a monthly basis to try to work on my time, so lovely clipboard lady, watch out!!! Paddy Hagan reports ... this is the second time I have attempted thisrace and although quicker than five years ago have still to master the descent without resorting to all fours. Also, the wall seemed harder to scale this time so either they've rebuilt it or I'm gradually seizing up. Matthew Cox reports on the Half ... approx. 250 runners set out from a sunny Howarth on what proved to be a glorious run around the moors of Howarth and Oxenhope for the Yorkshireman Half Marathon. This was my first entry in to this event and rumours of a complicated race route with little marking proved to be true! I set off at a brisk pace and found myself in a group of 3, chasing the leader and eventual winner Ben Mounsey of Calder Valley. My lack of route knowledge meant I was relying on following other more knowledgeable runners to get me round. This tactic came unstuck when after about 5 or 6 miles 3 became 2, and then the Keighley runner I was with tweaked his ankle and pulled out! I was left in no man's land with the leader out of sight so had no option but to slow up and wait for following runners to catch me. Thankfully, Ben Stevens of Ilkley was not too far behind and Ben and I ran the remainder of the race together. I am very thankful to Ben for his route choice as I would probably still be on Howarth Moor now had it not been for him. Ben led us home, with no one catching, and eventually pulled out a small lead on me in the last mile or so as I tired. Great run from Ben, Ilkley 2nd and 3rd. I finished in around 1.44. Sharon Williams adds I also competed in this popular off road marathon (26.2miles, 3095 ft of climbing). Having competed in the half last year I was seduced into stepping up to the very scenic marathon route (some steep climbs, bogs, woods, fields and fell) that takes you along parts of the Bronte Way and Calderdale Way, Oxenhope, Denholme and back to Haworth. The weather was warm and sunny with a few cool breezes and a very brief shower halfway along the route. It was nice to bump into Amanda Parnaby who was going well around the 21 mile mark. The finish was a welcome sight as every part of my body was aching. A well organised race, friendly atmosphere, good food and brilliant T-shirt. I also received a big box of chocolates for finishing 3rd LV40 which was a welcome surprise. Steve Weston reports ... A lovely sunny day in Catterick for the Para's '10' but thankfully not too hot to run in. This is run round the infantry training ground and to say the course is undulating would be an understatement, it's more like a 9.4 mile (Garmin Distance) rollercoaster with a compulsory water obstacle thrown in for good measure. I had a good race despite being caught in the toilet queue and starting at the back of the pack. However despite having to run through the crowds to catch people up I got a PB and ended up being second vet! Maybe I'll emply that race tactic again. From Alison Eagle ... The race title says it all - tough trail and that is what it was but not it appears to Tom Adams, in flying form once again. Winning the race in 53.55, although a different start to previous races (missing out the first up hill from Settle centre) and therefore a new record, in his present form he would have shattered the old course record as well I feel! I was 3rd Lady and 3rd LV40 in 1.16. Lovely little event (if you like fast runnable trail races) with great cake afterwards (free) and superb prizes, though only the winners of each caegory got one, the rest were all spot prizes. There were 63 finishers at tonight's race, including 24 Harriers. Thanks to Geoff Howard and all his helpers for a well-organised race. Ilkley had 1st team and 1st ladies team. Results of the Junior Sprint Fell Relays here. Richard Reeve reports ... A fast course not unlike the Leeds Abbey Dash, straight out and back along the Don valley with the start/finish up a bit of a hill. Either my chip didn't work or maybe, looking at results for this and other Great Runs, chip times for the first 50 or so finishers aren't published (why? ), either way annoying as I started well down the field and don't like wearing a clock. A bonus of out and back courses, apart from waving at your mates, is seeing the really fast runners charging back along an empty road. Chris Thompson, European 10,000 metres silver medallist led the pack but was outsprinted at the finish to lose by one second to Craig Mottram. Freya Murray was women's chamption in 33:01. Also racing were Stefano Baldini (former Olympic Marathon champ) in 29:33 and Chema Martinez (European Marathon silver last month) in 30:10. To see the action watch Channel 5 at 10.30 on 11 September.